BRUSSELS — NATO members signed an accord with Macedonia on Wednesday allowing the tiny ex-Yugoslav republic to become the 30th member of the U.S.-led alliance after a deal with Greece ended a 27-year-old dispute over its name. 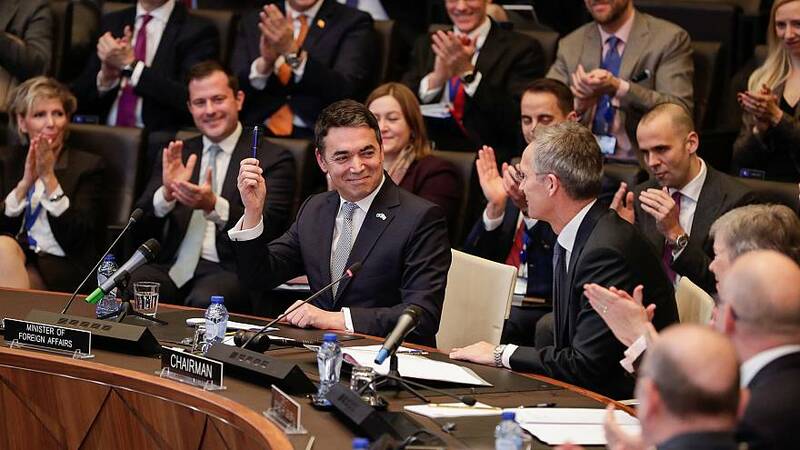 At a formal signing of the NATO accession protocol, which must now be ratified by allied governments, Macedonia's Foreign Minister Nikola Dimitrov hailed the moment as showing that the country "will never walk alone" once in the alliance. "We stand beside these 29 allies... able and ready to assume the obligations arising from our full membership in NATO," Dimitrov told a news conference after NATO ambassadors signed the protocol. The ratification process typically takes about a year, and the United States has said it expects Macedonia —now known officially as North Macedonia under the terms of its name deal with Greece — to formally join the alliance in 2020. NATO Secretary General Jens Stoltenberg said the admittance of a new member highlighted that all European nations who met the entrance criteria could join the regional alliance, a position Moscow rejects. "It shows that NATO's door remains open for countries that meet NATO standards and that adhere to the NATO values of democracy, the rule of law and individual liberty," Stoltenberg said. Russia says that by taking in Balkan members, the alliance is undermining security in the region. But Dmitrov said Macedonia's decision would improve regional stability, echoing the view of Western countries which see NATO and E.U. membership as the best way of preserving peace in the Balkans after the violent breakup of Yugoslavia in the 1990s. "For us NATO is about making the world more peaceful, more stable," he said. Three other ex-Yugoslav republics — Slovenia, Croatia and Montenegro — have already joined NATO, as have other countries in the Balkan region including Albania, Bulgaria and Romania. Both Greek and Macedonian parliaments have agreed to rename the country the Republic of North Macedonia, ending Athens' years-long veto of its neighbor's efforts to join NATO and the E.U. Greece sees the use of "Macedonia" as implying territorial claims to a Greek province of the same name. Russian President Vladimir Putin has also warned NATO against cultivating closer ties with Ukraine and Georgia, two ex-Soviet republics that aspire to join the North Atlantic Treaty Organisation, which is headquartered in Brussels. After the Macedonia signing protocol, Stoltenberg praised Georgia on Wednesday, saying: "We are very encouraged by what we see in Georgia, their commitment to reforms, their commitment to strengthening defense and security institutions, their commitment to transparency, judiciary reforms."